My last post about reading sparked a lot of interest among WordPress Bloggers. I thought I would follow it up with a short description of some of what I have read and am reading this year. I ventured into reading this art history book as it peaked my interest on the ISI.org website which is devoted to conservative scholarship that underpins American liberty. As I pushed through the high academic writing, I unearthed a treasure trove of outstanding theology, philosophy, and cultural understanding. These authors taught me that true appreciation and production of high art requires a Trinitarian Christian worldview. The thesis was masterfully supported by the writers. Wright provides a wonderful hope-filled eschatology in this work. He emphasizes the long lost doctrine of the resurrection of the body and how that matters to the believer’s life now and upon resurrection. He contrasts this view with the common Left Behind eschatology that lacks the richness of biblical eschatology. I found Wright to provide several large pieces of the puzzle that I was missing as I already leaned toward a different picture of the end times. There were a few areas that Wright discusses in his book that I am not ready to assimilate into my thinking, but they did provide interesting points in a conversation worth considering. This is a fabulous prophetic curriculum full of personal anecdotes, testimonies, and solid teaching about hearing God, cultivating the prophetic gifting, and/or a prophet’s call. I reread this short book as a companion to having read Surprised by Hope. It seemed fitting to reread Lewis’s imaginative rendition of a picture of heaven. This book has some delightful insights into both our world and heaven. It is certainly a fictional musing of biblical truths. Some of his musings seem to create an opening of possibilities and others leave me uncertain as to his intentions. However, I find with all Lewis books that I gain more in the subsequent reading and then the reading after that as I grow in knowledge and understanding. I have read the Chronicles of Narnia more than 20 times and I hope to read them 20 more. Every time I enjoy a fresh reading of old favorite passages and find new ones. The first time I read one of Lewis’ non-fiction works, Miracles, I understood very little. The next time I picked it up, a good many years later, I found a wonderful book that the little I understood on this reading created wonder for that which I had yet to digest. 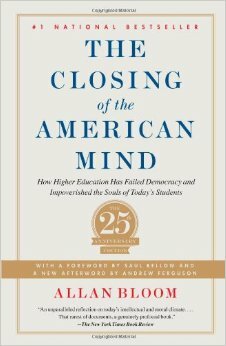 Bloom, a college professor, wrote this seminal work in the 1980’s. Even though some of the content is dated, I find it fascinating to read his insights on the student population and the social concerns of the day. I find that while we have continued further in this direction in many ways in America, our current situation is not all that altered from Bloom’s exposition. I am only a third of the way through this book, so I will leave further commentary for another occasion. It’s only February, I have a great many books yet to read this year. . . Check out my own book, an e-book: Back the Future: Rebuilding America’s Stability here on Amazon.